From 20th to 30th of July, GAIA Kosovo organized a workcamp in the monastery of Draganac, near Gnjilane/Gjilan. A dozen of volunteers gathered to help the monks for the preparation of Slava, the celebration of their saint patron, on the 26th of July. The volunteers camped in Stari Draganac, an abandoned village on a hill above the monastery. They came everyday to the monastery to help hosting the guests who were coming, but also to learn more about the monastic life. The group of youngsters was composed in majority of Albanians curious about the life inside an orthodox monastery in Kosovo. Some of the young people never had much contact with the Orthodox church, or even members of the Serbian community in general. Those volunteers expressed how much they learned about their own country, discovering a new culture that they never approached before, even though it happens to exist so close to them. The volunteers were also international young people, interested in the discovery of an ancient religious culture that they do not have the opportunity to meet in the western part of Europe. All of the participants had the opportunity to visit the city of Prizren, the monastery of Visoki Dečani, and the female monastery of Peja/Peć. The camp is an attempt to invite coexisting Kosovar communities to meet. The monks, very welcoming, allowed the campers to gain insight in a long-lasting culture that is not necessarily well-known even for the country’s inhabitants themselves. The abbot, Father Ilarion, was present to answer the numerous questions the participants had. Those ten days spent inside the small secluded community permitted to fade the veil of mystery surrounding monastic life and the Christian orthodox church. Rather than remote strangers, the monks quickly became friends. The history of the different monasteries reminded us all that divisions are not eternal, and that the tolerance of the others’ beliefs and ways of life is a must to live in a peaceful society. Every participant gained an immense knowledge, about a sometimes-forgotten Kosovar culture and history, but also about the self, the relations with the others and the acceptance of the differences. The monastery was not only a place of religious life, but first of all a place of exchange and discoveries, on both sides. 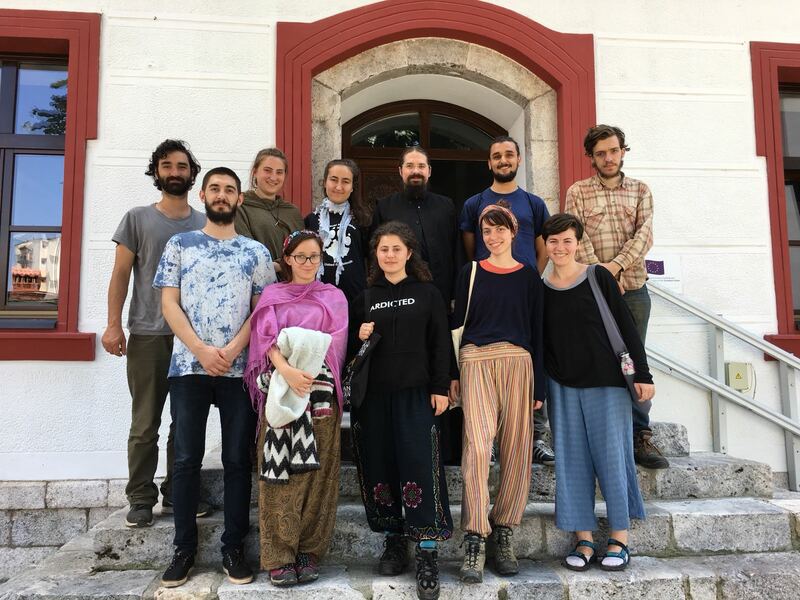 This workcamp was proven to be successful once again, so we hope that our traditional workcamps with Draganac monastery will continue in the next years.